C.L.A. (Conjugated Linoleic Acid) has many benefits including: Increasing the metabolic rate, decreasing abdominal fat, enhancing muscle growth and enhancing the Immune system. C.L.A. (Conjugated Linoleic Acid) CLA is a Scientifically proven, effective nutritional supplement that naturally slims the body by inhibiting the activity of lipase enzymes that usher fat into fat cells. It also increases lean muscle mass which enables your body to burn more calories and function at optinal levels--the result, you lose fat in all the right places.CLA's ability to reshape your body by inhibiting the activity of lipase enzymes that usher fat into fat cells makes it the perfect choice for anyone serious about reclaiming their health or dropping body fat. Ingredients: Safflower Oil 1000 mg, (Carthamus tinctorius) (seed) Contains 80% Conjugated Linoleic Acid. Recommended dosage: Take 1 capsule twice daily prior to your two largest meals. 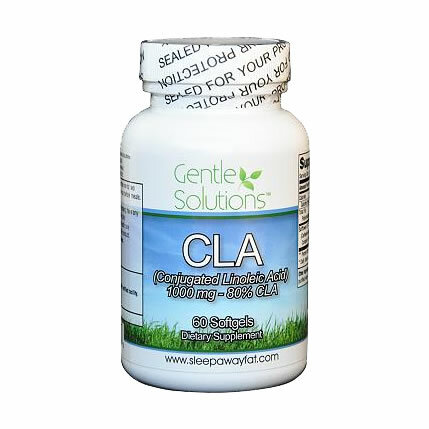 Studies suggest CLA is most effective when taken up to 30-60 minutes prior to meals. I have taken the CLA off and on with the Collagen. Usually, in the first three weeks, my abdominal fat \"pooch\" shrinks. Other \"fattier\" areas (such as cheeks, upper arms, rear end) seemed to be slowly reducing as well. I also notice that my appetite is somewhat reduced. I had no gastrointestinal problems with it which I have with other products. I go on and off the CLA, based on my use of other fatty acids, but overall I highly recommend Gentle Solutions and the CLA supplement. They have always shipped fast too. I took C.L.A. with my dinner (my largest meal by far) and I also took the Gentle Solutions Collagen AM. It was wonderful. I am a pasta lover and you can tell. I carried all the weight in my tummy and now it's gone. This stuff totally works! I love it!! Thank you again Tricia for the great suggest of adding C.L.A. to my daily routine. Since starting to take this with the Gentle Solutions Collagen AM Formula, I have seen a jump start in weight loss around my abdomin.